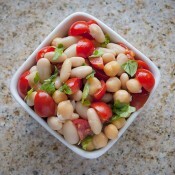 Make the most of the end of summer abundance of fresh tomatoes and basil with this Italian chickpea and bean salad. 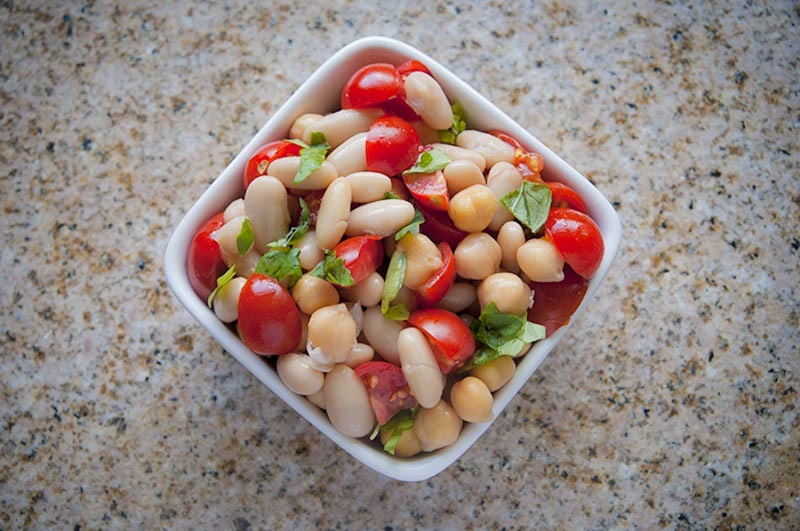 The sweet tomatoes play with the subtle nutty flavour of the chickpeas and white beans. The combination of balsamic vinegar and red wine vinegar add a bit of acidity to balance the sweet, creaminess from the tomatoes and the beans. Toasted pine nuts add a little hint of crunch to the dish. 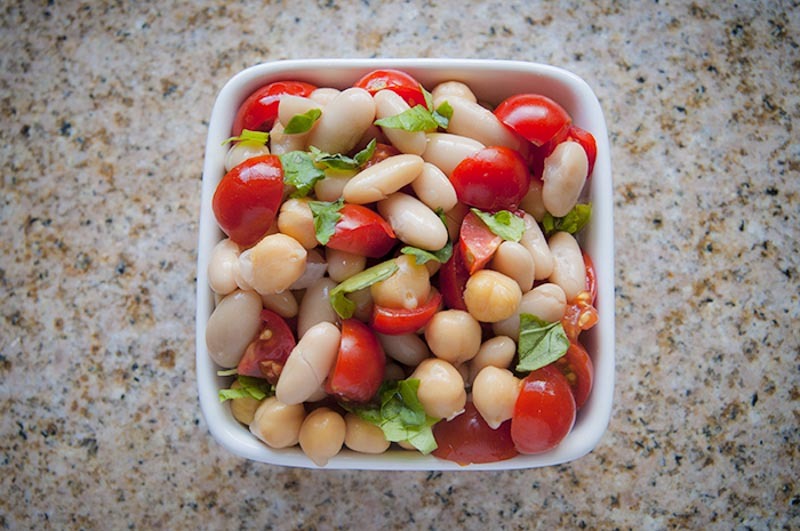 This Italian chickpea and bean salad is packed with vegetarian sources of protein, making it a perfect dish for muscle building. It also packs filling fiber from the beans and chickpeas and heart healthy monounsaturated fat from the extra virgin olive oil. The tomatoes add lycopene, vitamins A and C, and folate to give you a healthy boost of antioxidants. You can serve this salad by itself or over a plate of leafy greens with extra fresh basil leaves tossed into it. You could also serve it over brown rice or quinoa, which would up the protein content of the salad. Just be sure if choosing to serve the salad over rice or quinoa to let it cool to room temperature first. Drain and rinse the canned chickpeas and cannelini beans. Pat them dry and toss them together in a bowl. Add in half of the finely chopped sweet onion and the diced cherry tomatoes. Set this bowl aside. Put the pine nuts into a dry skillet and cook over medium low heat, stirring constantly until the nuts are lightly golden and fragrant. Set aside and leave to cool. 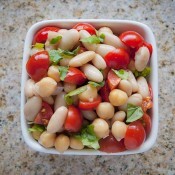 Once cool, add them to the bowl with the beans, tomato and onion mixture, and toss together. In a separate small bowl, whisk together two tablespoons of olive oil with two tablespoons each of balsamic and red wine vinegar to make a dressing. Pour the dressing over the salad. Tear the fresh basil leaves into the salad and toss together so the flavours are evenly distributed. Serve immediately either as a salad on it’s own, or as a side with another of our recipes.